THE MONKEY’S PAW (2013): A New Coat Of Paint For An Old Curse – Schlockmania! When W.W. Jacobs wrote “The Monkey’s Paw,” he created what might be the horror genre’s ultimate expression of the saying ‘Be careful what you wish for.’ This classic tale of wish fulfillment gone horribly wrong has inspired several horror films and t.v. show episodes over years, including a classic segment in the 1972 Tales From The Crypt anthology and the Vietnam War allegory Deathdream. The story’s power endures because it gets at truths about human nature and its sometimes self-defeating elements that will always remain honest and compelling. The most recent take on this tale is simply entitled The Monkey’s Paw, a t.v. movie made for Chiller T.V. that offers a few new wrinkles alongside attempts to make the story conform to current horror trends. Jake (C.J. Thomason) is unhappy with his lot in life: he works for a dead-end factory job his ex-girlfriend’s jerky husband, his mother’s slowly dying of cancer and he’s too cash-strapped to even afford a car. Things change when his newly-fired supervisor Gillespie (Daniel Hugh Kelly) passes him a trinket his daddy gave him as a little boy: a monkey’s paw that can supposedly grant wishes. As a joke, Jake wishes for a car – only to discover one waiting with the keys in the local bar’s parking lot. 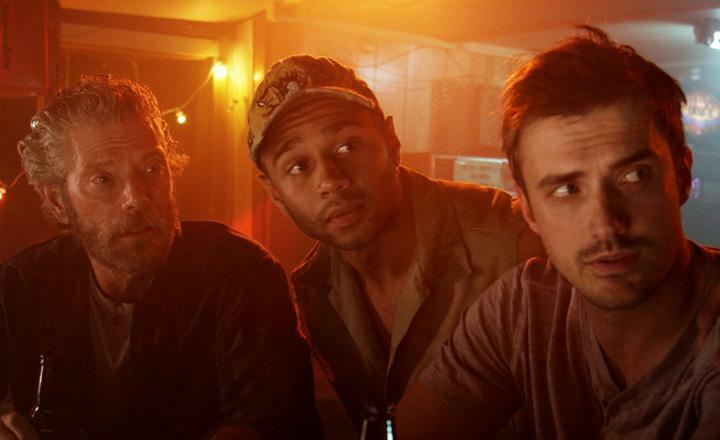 He takes a ride a drive with grizzled co-worker Cobb (Stephen Lang), only for things to end in a crash. He uses another wish to bring Cobb back to life – and that’s where things really take a turn for the dark and tragic. The Mon key’s Paw is interesting as an attempt to wed the old with the new in the horror genre. It’s at its best when it sticks to the themes of the Jacobs story: for example, a scene where Gillespie reveals the relationship of the cursed paw to his family history is chilling in a subtle way. There’s also a certain effectiveness to the way that the curse uses things that Jake enjoyed but never appreciated against him – and the film certainly never shies away from the tragic aspects of the curse. However, The Monkey’s Paw is on weaker ground when it tries to update the horrors of the story. As is often the case with adapting a short story into a full feature, the filmmakers are in the position of having to add new elements to flesh out the narrative. Unfortu nately, they lean too hard on zombie and slasher movie elements in the new material to make the movie palatable to younger audiences. These elements deliver plentiful cheap thrills but also detract from the source story’s themes, reducing the story to another “killer on the loose” tale with a supernatural hook. The script also suffers from thin characterizations and a storyline that makes its protagonist slow to pick on up things, forcing him to be self-defeatingly passive until the third act. 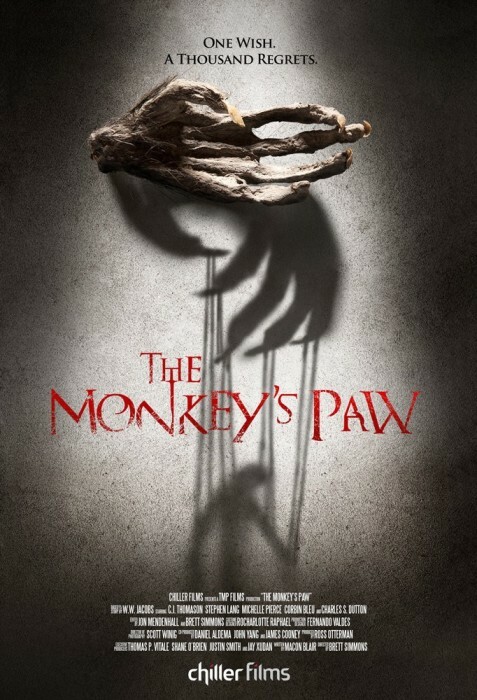 That said, The Monkey’s Paw remains watchable despite the wrong-footed choices of its storyline. Brett Simmons’ direction is slick and aggressively paced, making effective use of excellent, moody cinematography by Scott Winig and some impressive, crumbling New Orleans locations to build an atmosphere. He’s a little too fond of cheap scares for his own good but his work gets the job done. It also boasts a good supporting cast for a t.v. movie: Kelly does nice work with some exposition heavy scenes and Charles S. Dutton brings some welcome gravitas to a sketchily-drawn cop character. That said , the main reason to see The Monkey’s Paw is the performance by Stephen Lang as Cobb. This underrated character actor, whose credits include everything from Last Exit To Brooklyn to Avatar, can always be counted on for a solid, committed performance and he doesn’t disappoint here. Lang does an effective job of transforming from a charming layabout into a supernatural killer and brings a surprising depth to his work, even when the script has him spouting quips during stalking scenes. The vigor he puts into his role gives the film a charge it might not have otherwise had. In short, The Monkey’s Paw is a mixed bag because it doesn’t fully grasp the timeless nature of its source material – but it is slick, committed to its grimness and boasts a fantastic performance from Lang.